Question on LinkedIn: Looking for ideas for introduction/icebreaker ideas for upcoming HR meeting. – I once developed an icebreaker for an internal leadership group I was facilitating, and it was based on the “Bingo” concept – instead of numbers, I put facts about delegates in the boxes (e.g. a hobby, a birthdate, when they joined the business etc etc) and the group had to go around each other and find out who it related to. The person who filled their sheet first shouted bingo! – These are always fun. 🙂 Another ice-breaker I’ve done before is for everyone attending to draw a number from a bowl. In ascending order, each person will stand up, introduce themselves and what they do, and share a fun factoid about themselves. After each person does this, they must recall out loud each person that went before them and the fun factoid. Obviously, the first person has it the easiest and the last person REALLY has to pay attention. It’s fun to see how far you can make it. – I have used an autograph format. With 31 people attending, I would list 25 different activities, with space behind each one for an autograph. Each person receives a sheet with instructions to circulate and find people who fit the criteria, and have them sign the sheet. The items can be funny as well as challenging. I include things such as: – Has been in every province and territory in Canada; has ridden in a hot air balloon; has both sets of grandparents still living (watch how everyone makes a bee line over to the younger members on the team); has both a dog and a cat, etc. There can be a prize for the “winner” or you can make a badge proclaiming that person the Networking Champion!. It’s a low stress, high involvement activity. and helps people to gain some interesting information about their colleagues. – GIve everyone a marker and a piece of construction paper, have them trace their hand and then cut it out….on the thumb, they write down a personal non-work goal, next finger they write down a team goal, and for the remaining three, they write three goals for 2013. You can put tape on the back of the hands and post them on the wall (or on the large 3m sheets) for all participants to see. Drives home the importance of focus and goals in a fairly fun way……and have people sign their hands! (1) ICEBREAKER IMPROV GAME “EXPERT ANALYSIS” – Have a person stand up front and talk about whatever topics you shoot at them (ie, the new KFC Double Stacker) as if the’re an expert. Not everyone will go on this, but if you are feeling inclined, make sure you jump at the opportunity. So after I shoot a topic at you, after 15 seconds, someone in the audience shouts a different topic and the speaker needs to switch gears right away…then another topic 15 seconds later. And to prevent shyness, need to keep emphasizing…each speaker spends 2 minutes doing this discussing roughly 10 topics…this is when I take notes and critique each presentation…I explain things like hands in pockets, grabbing one hand and then the other, UMM UH OH UMMs, reserved or quiet voice that isn’t delivered with energy, dancy or shaky or shuffling feet (explain u need to walk with a purpose), over-blinking (can be distracting to the audience), hands on the hips too much (which can exude confidence but can also be too Superman pose like and a little defensive), etc… (lookup more bad habits/nuances) – and this is a good exercise because it shows speakers in their natural state. And a lot of the participants might say that this isn’t a real presentation but it does show where the speaker is most natural. The intention is not to make clones or automations that do the same presentation but to enhance the good things, identify strengths and find out what you can improve upon. (2) GOOD ENDING IMPROV GAME “10 FINGERS” – Go in a clockwise circle fashion and hold up 10 fingers. One person starts by mentioning something about them (history, present, last week, a badge of honor, religion they are, etc…just nothing obvious like “I like WECT better than WWAY” or “I’m a female”) and if whatever they say you have also done or can do, then keep a finger up. Keep going until last one holding a finger wins. 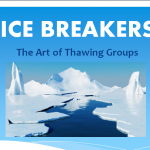 (3) ICEBREAKER IMPROV GAME “5 THINGS” – You can also break up this game into different groups (maybe in groups of 5 people – Try not to go with the same people as you’ll be going with now, later on. Try to mix up the groups throughout the day, but don’t spend too much time trying to find a group either. There will be times where you’ll be in the same group as some people before, and that’s fine too. Just try not to get a set core each time.). Now each group will play 5 things for 20 minutes – HOW IT WORKS is that someone will come up with a topic and the next person will come up with 5 things associated with that topic. Also, the one person who is responding with 5 things (types of candy, car, football teams, etc..) and we as the rest of the improvisors will count after each one u say…then the person who did the naming of the things gets to pick the next person and ask them to name 5 things (example: Skittles…ONE! Snickers…TWO! etc…) – mention how you can play this in bars with new people you meet or at business functions that are in bars – can be unreal, make belief, made up stuff too! does not have to be logical (i.e., 5 types of candy bars – you can say “crunchy ones, big ones, Neptune Marshmallow, Fruit sticks, donut diggers”) and after I say each one, as a group, we count it out…so after I say “crunchy ones” the rest of the people in the group say “1”, then “2” and so on until we reach 5…now you can ask the fellow partners in the group anything, so it can be “5 types of” or “5 ways to” or “5 things that” or whatever…can be anything! (4) ENDING IMPROV GAME “GROUP OBJECT” – Divide into 2 (or 3 or 4, whatever) teams of 8 (doesn’t have to be same group as before) – Object Game – all groups go into different rooms and discuss an object that they can form or become as a group (i.e., car, clock, vacuum) and do it for 10 minutes then 1 at a time come onstage and perform the object.